What is 'networked readiness' and why does it matter? 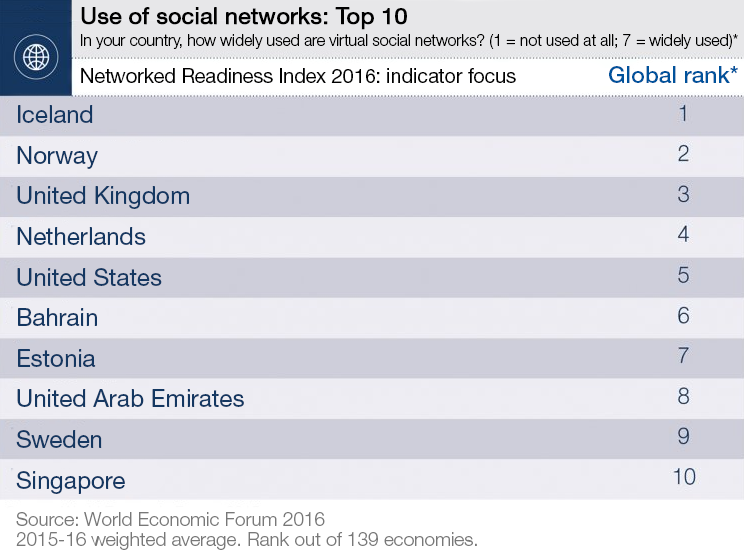 Networked readiness is a key indicator of how countries are doing in the digital world. The World Economic Forum’s Networked Readiness Index 2016 measures how well an economy is using information and communications technologies to boost competitiveness and well-being. The world is at the dawn of the Fourth Industrial Revolution, which represents a transition to a new set of systems, bringing together digital, biological and physical technologies in new and powerful combinations. Networked readiness shows how ready each country is to reap the benefits of that transition. As you would expect from such a complex issue, the ranking is drawn up using a wide range of information. Data is gathered from international agencies such as the International Telecommunication Union, UNESCO, other UN agencies and the World Bank. Further indicators come from the World Economic Forum’s Executive Opinion Survey, which was completed by over 14,000 business executives in more than 140 countries. Networked readiness depends on whether a country possesses the drivers necessary for digital technologies to meet their potential, and on whether these technologies are actually having an impact on the economy and society. To get an accurate picture of all the drivers and the full effects, the study breaks down the information into different subsections. 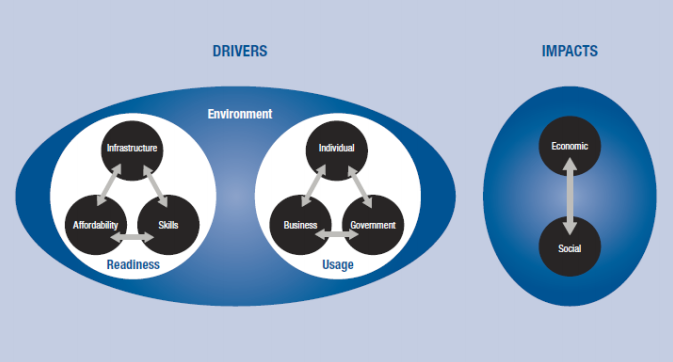 The drivers are grouped within three sub-indexes: the overall environment, readiness (which includes infrastructure, affordability and skills) and usage (which is made up of individuals, business and government). Impact is measured in terms of both economic and social impact. The 2016 index has highlighted a number of key issues. The digital revolution is changing the nature of innovation, which is increasingly based on digital technologies and on the new business models it allows. 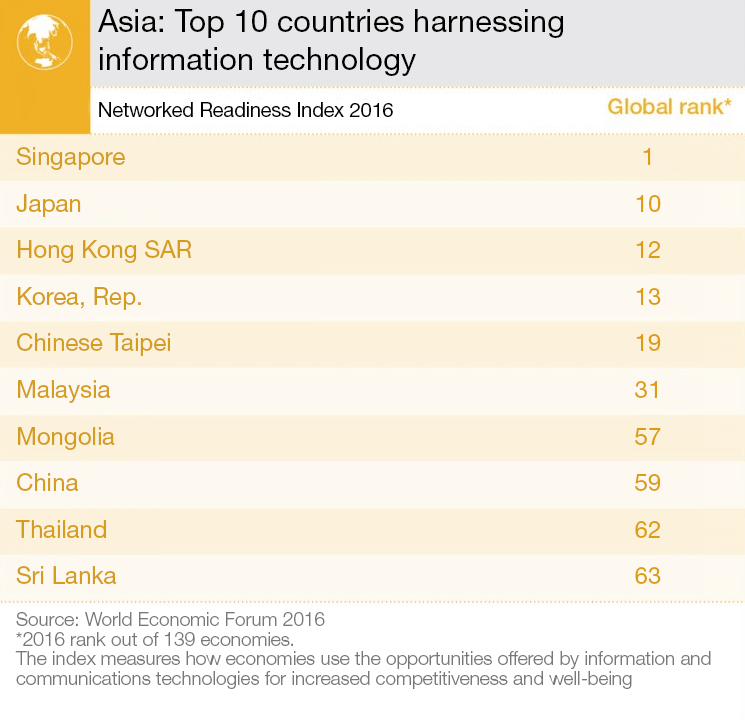 It is interesting to note that economic power does not necessarily reflect networked readiness – the top 10 Asian countries show that while Singapore leads the world, China is only four places higher in the ranking than Sri Lanka. Companies are facing increasing pressure to innovate continuously. Seven countries stand out in terms of the economic impact of their corporate digitization: Finland, Switzerland, Sweden, Israel, Singapore, the Netherlands and the United States. It is noticeable that all seven are characterized by very high levels of business information-technology adoption. Businesses and governments are missing out on a rapidly growing digital population. Demand for digital products and services by a global consumer base is largely being met by a relatively small number of companies. Businesses need to act now and adopt digital technologies to capture their part of this growing market. A new economy is taking shape, requiring governance and regulation to keep pace. As the new digital economy becomes more established, the right framework conditions will be crucial to ensuring its sustainability. Digital technologies are unleashing new economic and social dynamics that will need to be managed if the digital transformation of industries and societies are to deliver long-term and broad-based gains. This rapid change is being managed better by some countries than it is by others, with some surprising results. Iceland tops the ranking when it comes to the use of social networks. In this new global economy, a country’s industrial might no longer plays a key factor. A resilient digital economy calls for new types of behaviour, leadership and governance. The Networked Readiness Index helps identify which policies are working and which are not, which countries are leading the way and which need to do more. In this way it is helping the world understand and navigate a crucial but complex journey into a very different world.